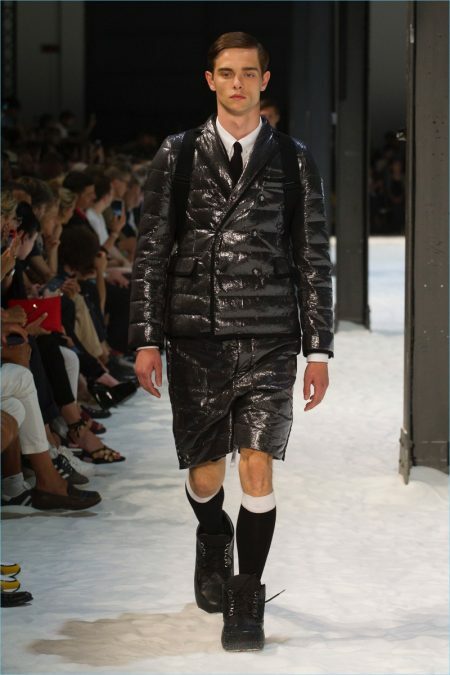 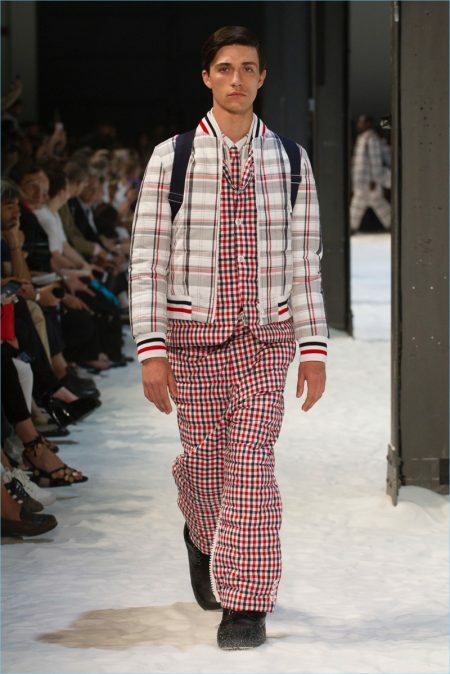 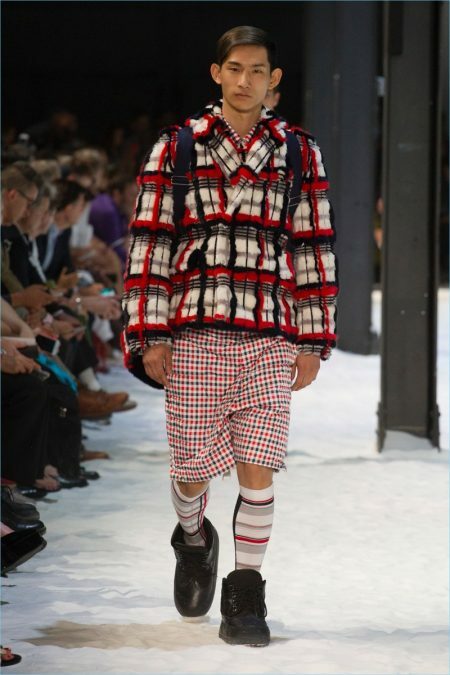 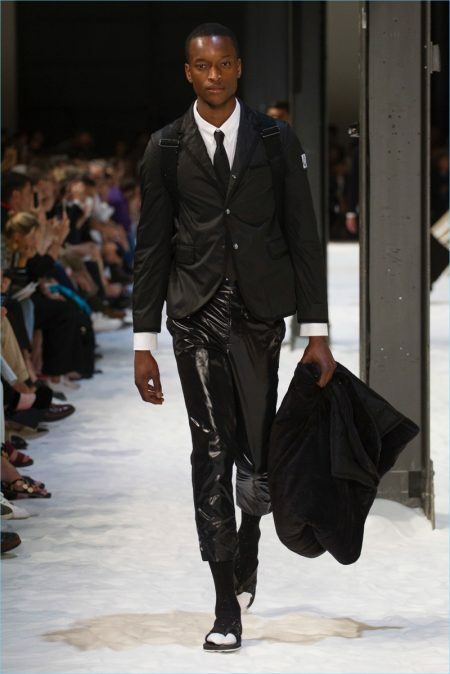 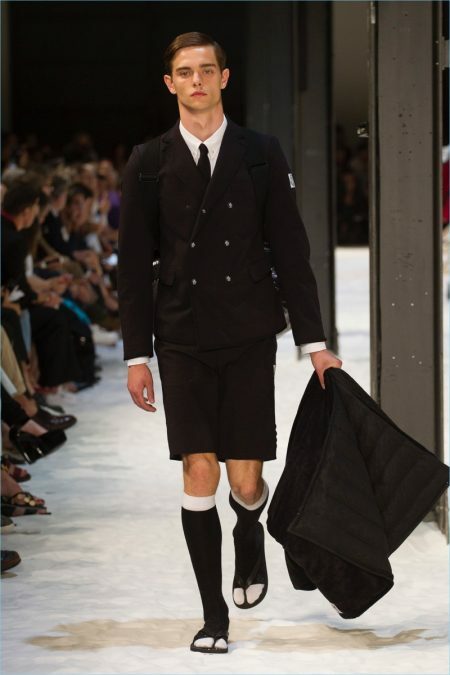 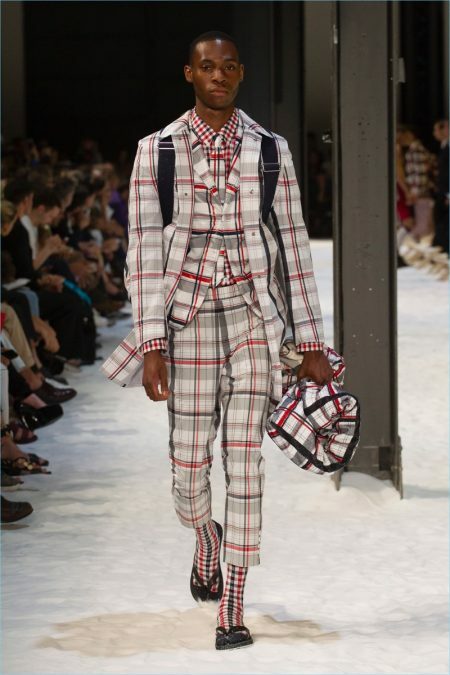 Moncler Gamme Bleu presents its spring-summer 2018 men's collection during Milan Fashion Week. 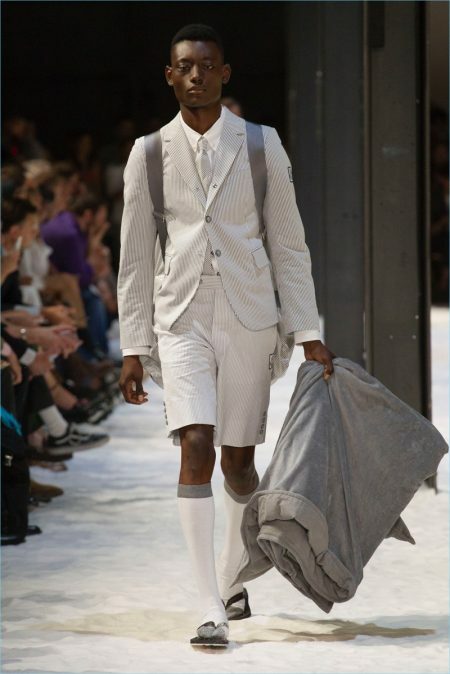 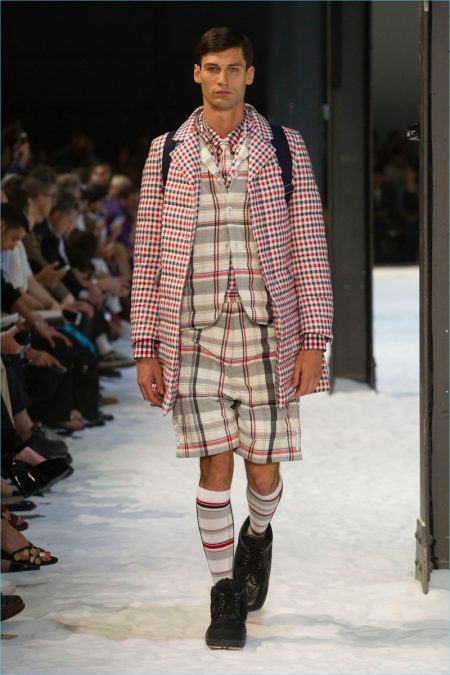 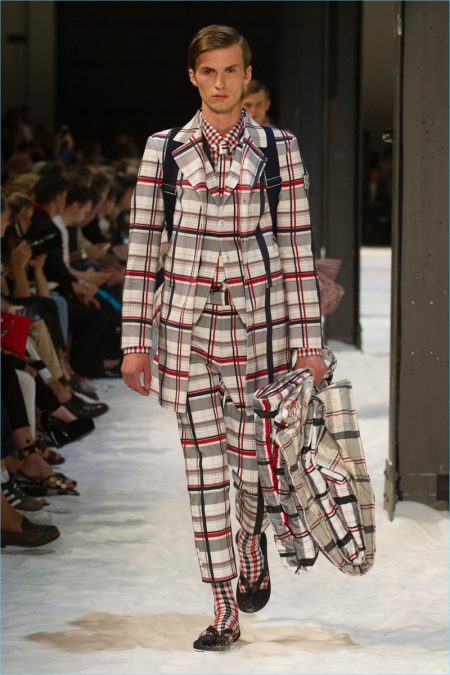 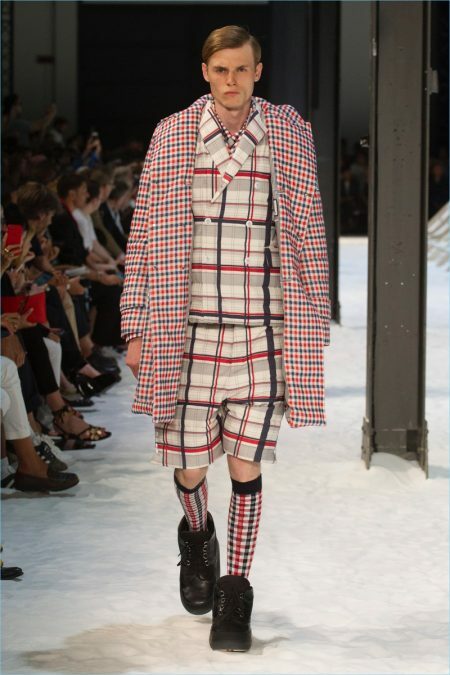 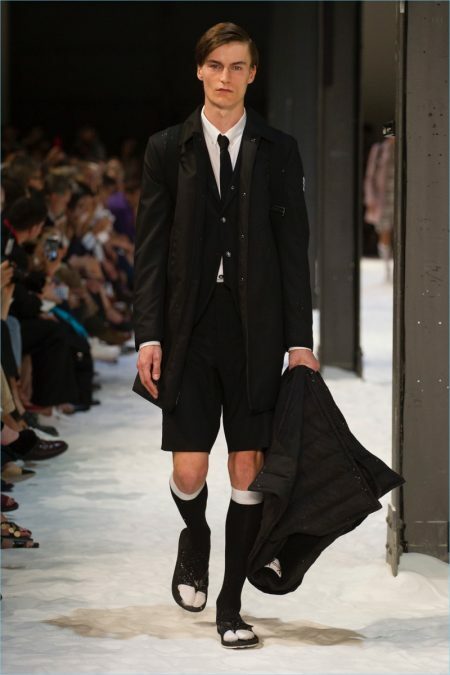 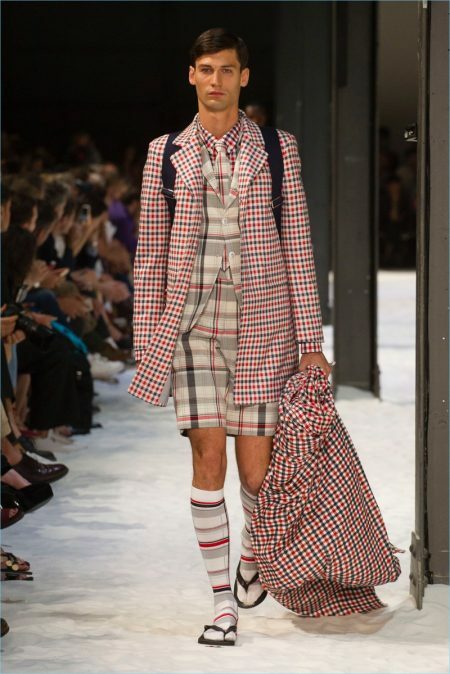 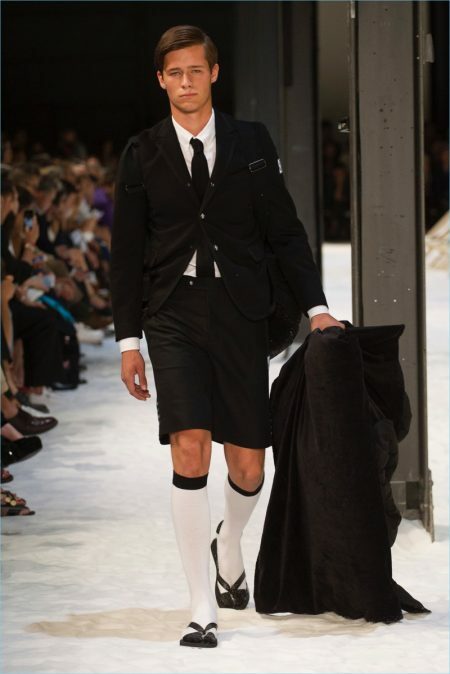 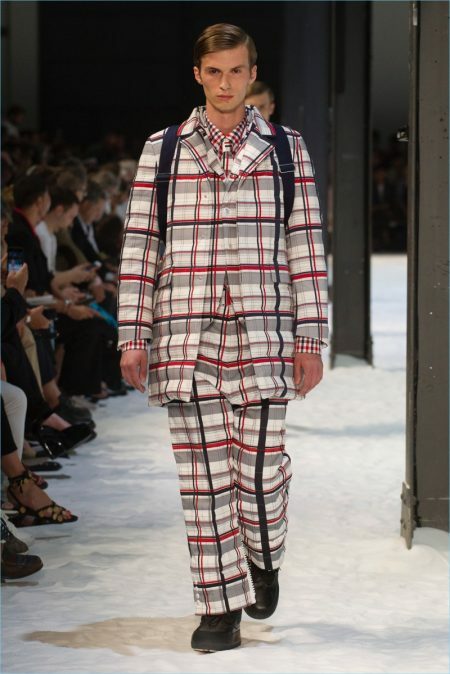 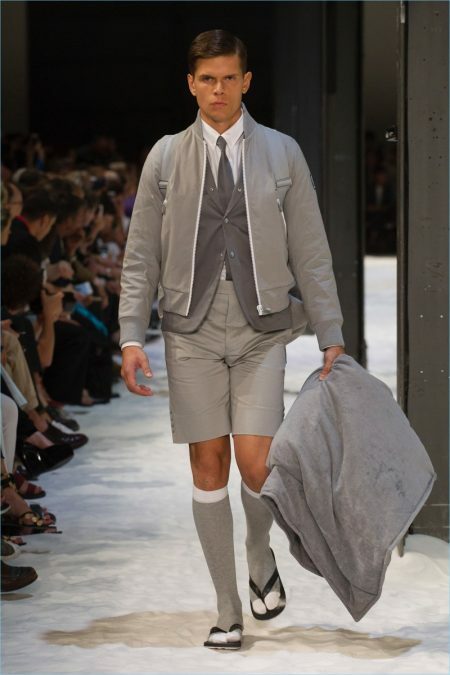 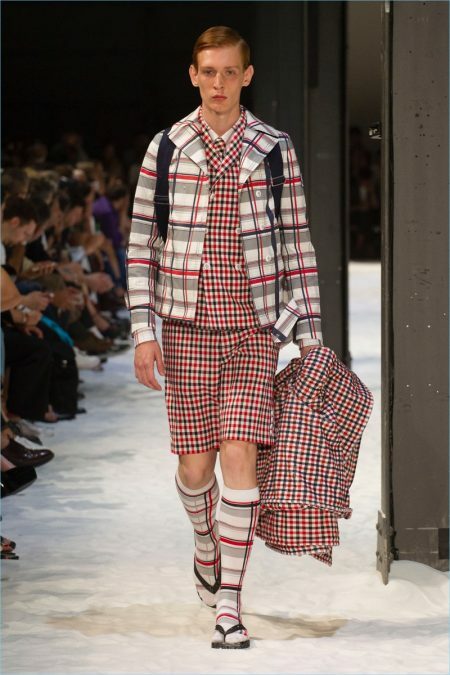 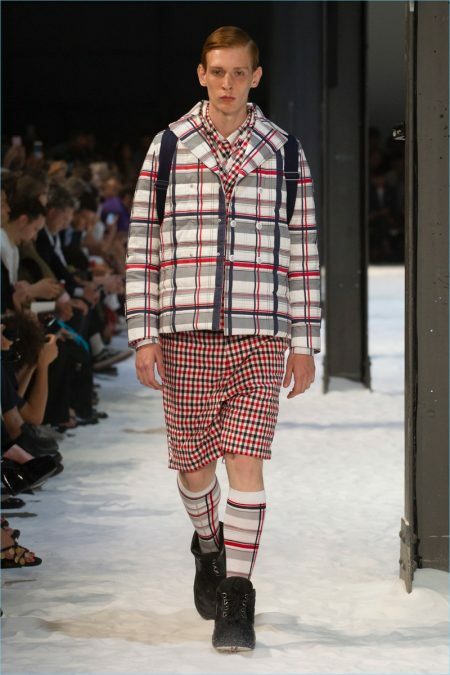 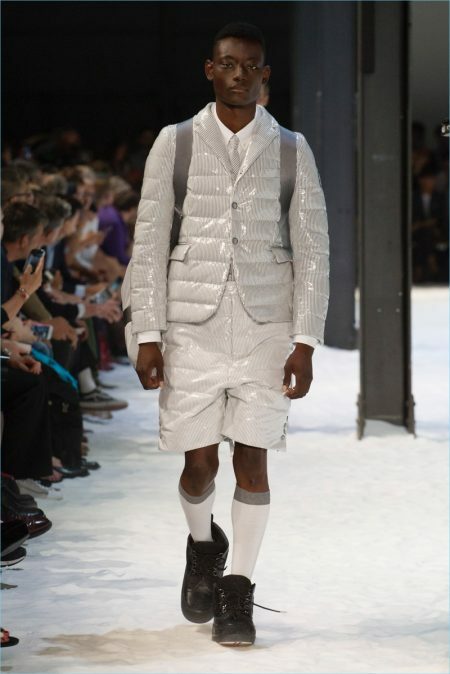 Thom Browne makes a simple proposal for spring-summer 2018–transition. 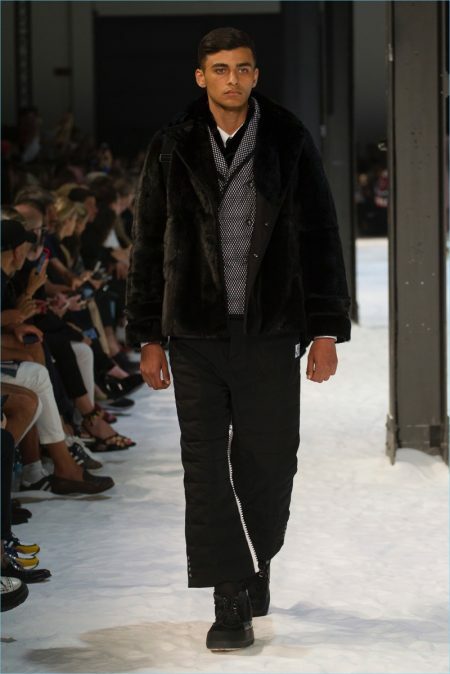 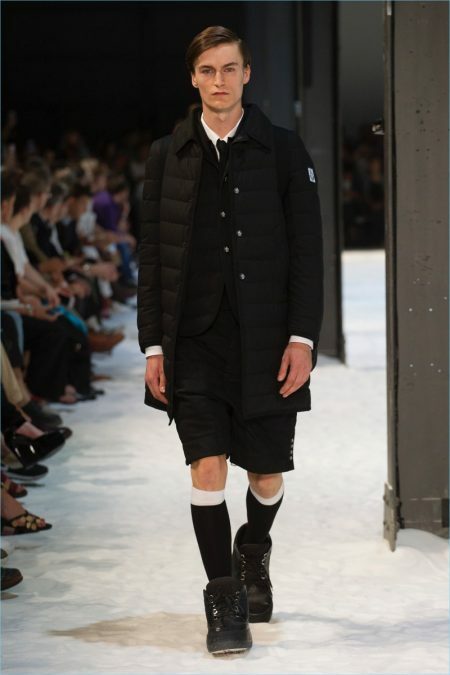 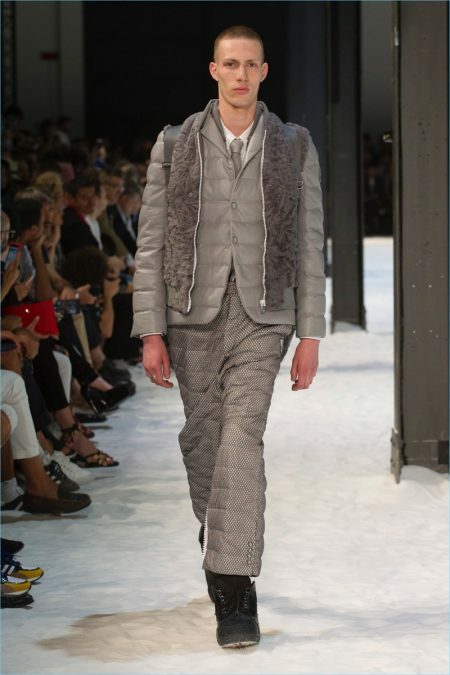 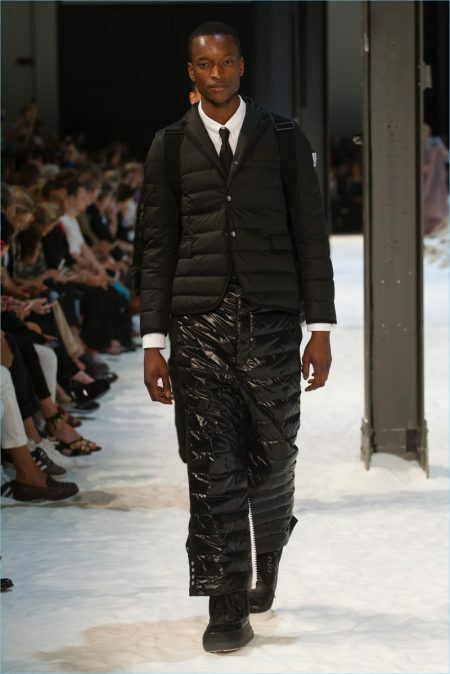 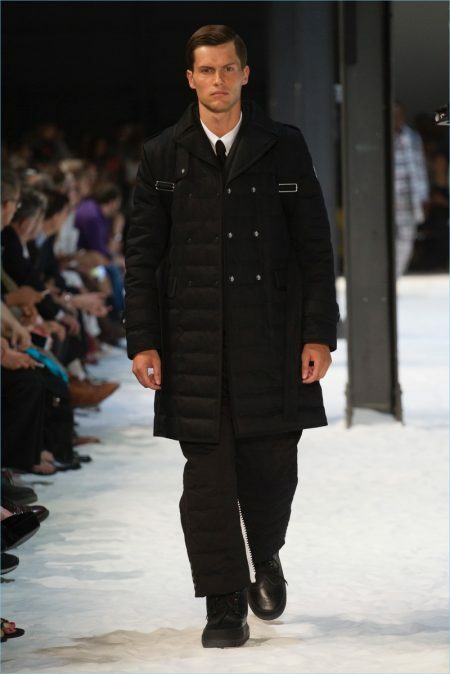 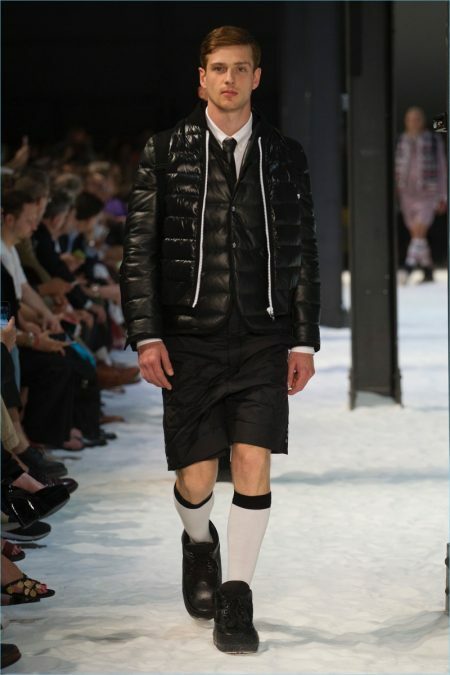 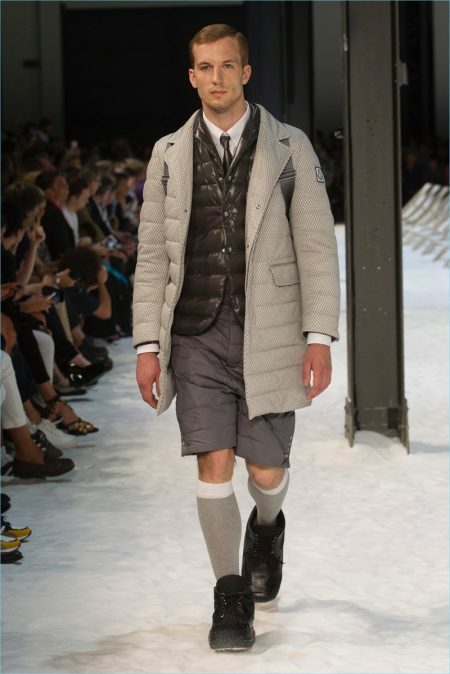 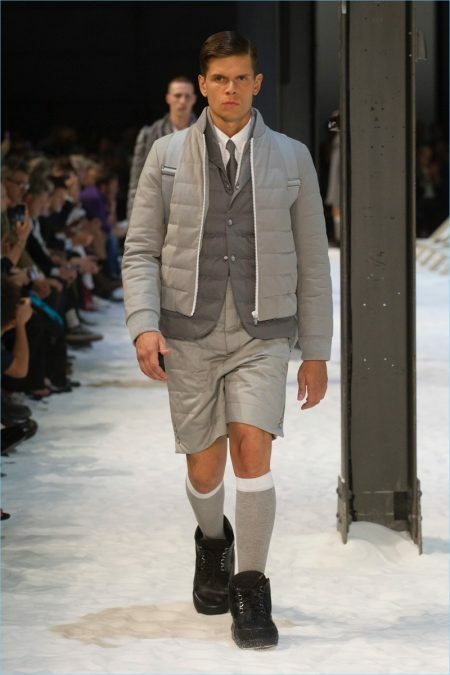 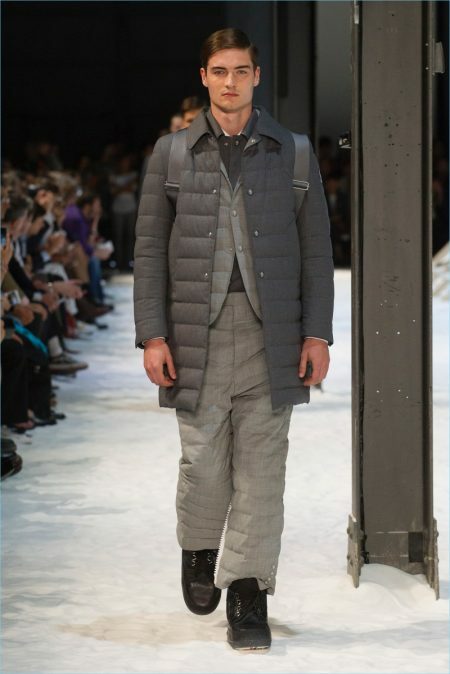 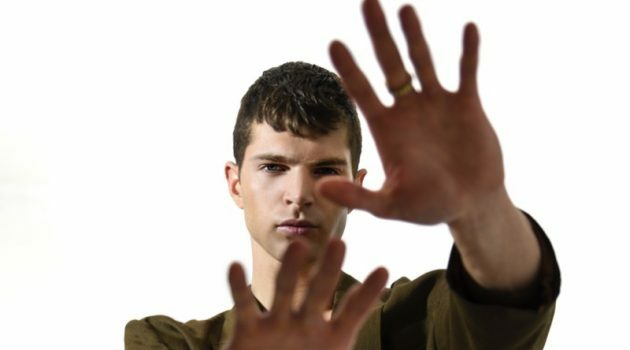 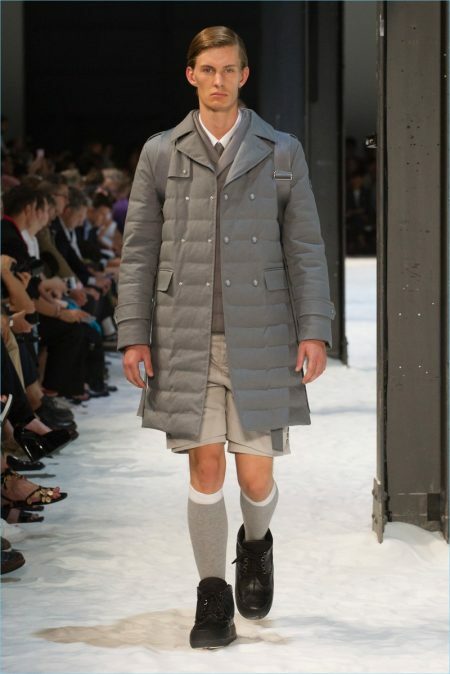 The American designer envisions a season of transition for his latest Moncler Gamme Bleu collection. 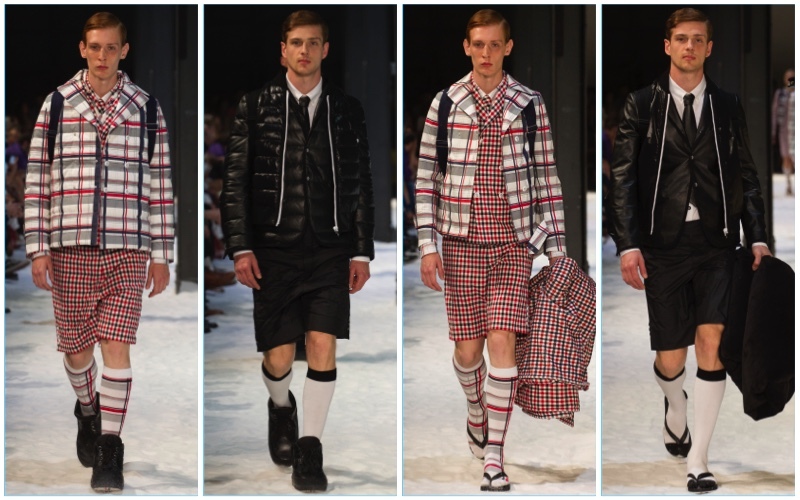 Browne's trademark red, blue, and white join the customary grey and black for the occasion. 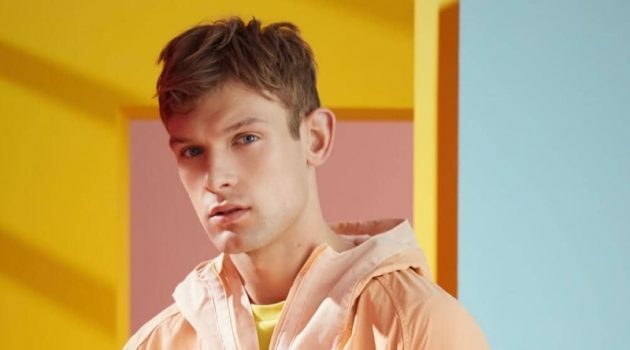 Executing the idea of transition, Browne layers identical looks. 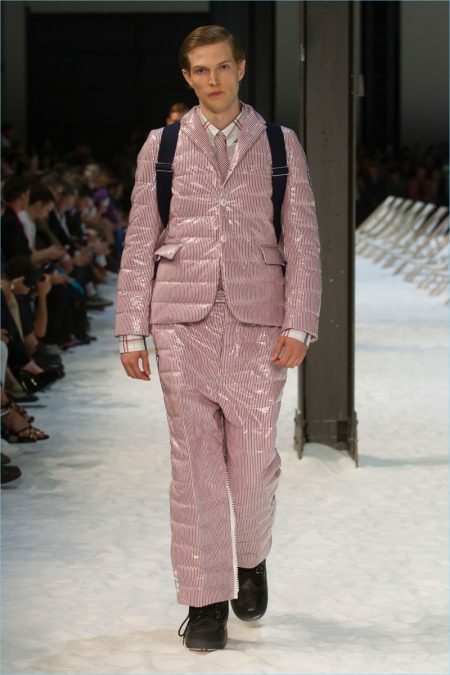 The range cheekily showcases down-filled looks on top of lighter alternatives. 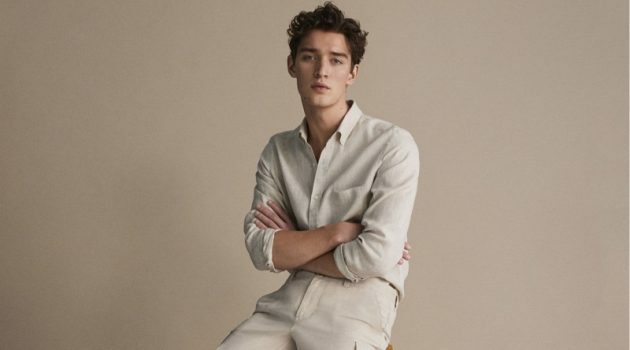 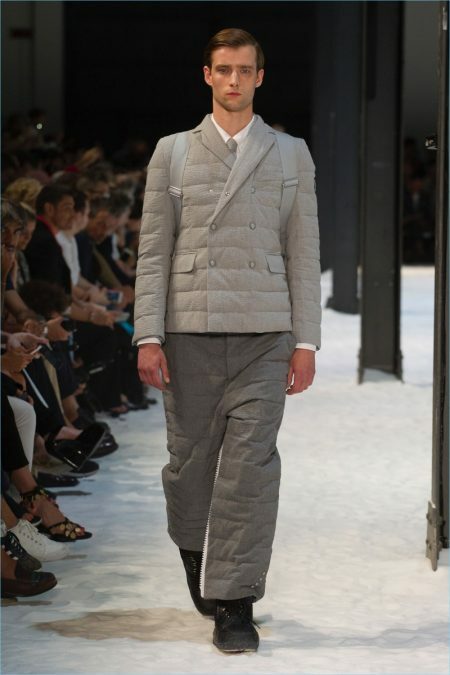 Playing with fabrics, the collection brings together cotton gabardine, seersucker, wool mohair, cashmere, cotton poplin, and more. 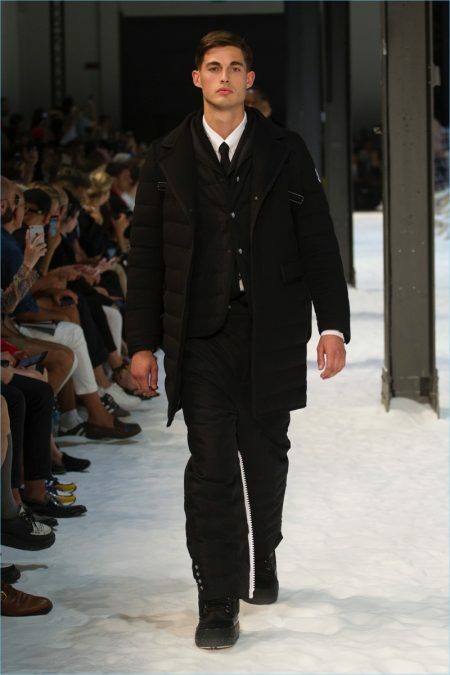 MONCLER GAMME BLEU reflects the synergy of Moncler’s expertise in active sportswear and outerwear with the hand-made tailoring sensibility of Thom Browne. 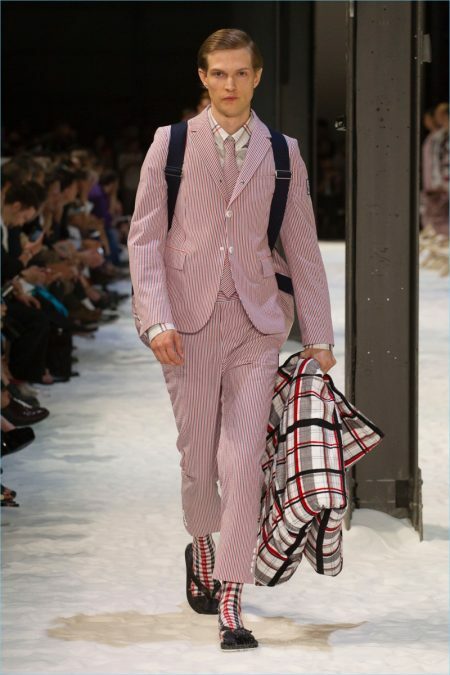 For Spring/Summer 2018 the collection concept is based on how seasons can be easily transitioned. 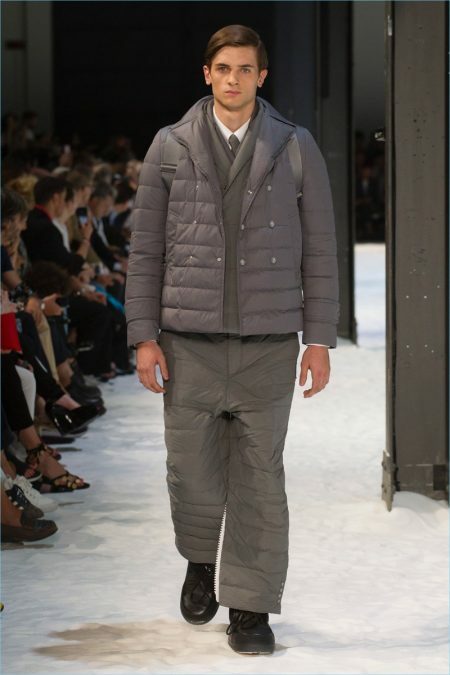 This idea of a smooth transition between seasons is represented with down-filled looks made with over-sized plastic zippers worn over identical looks made without the down-filing. 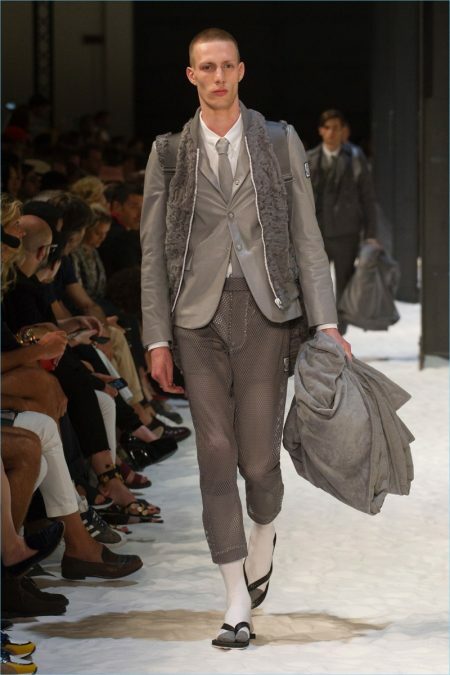 The collection is made of three groups: the grey and grey and white group, the red, white and blue group and formal black-tie group. 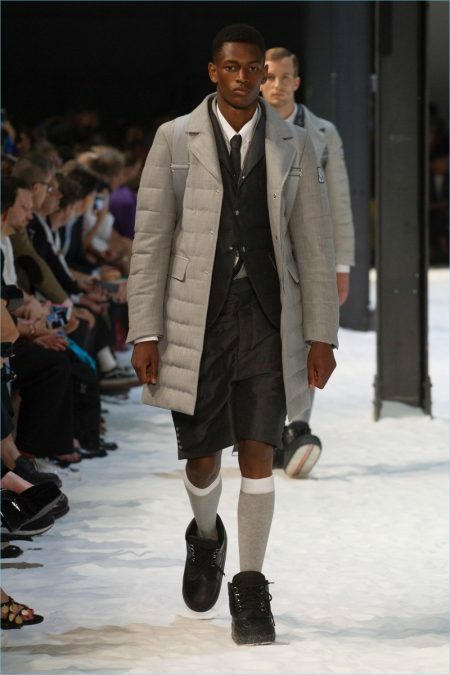 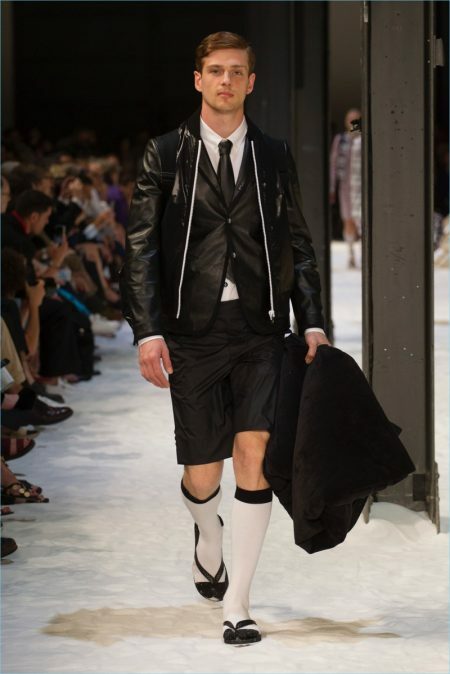 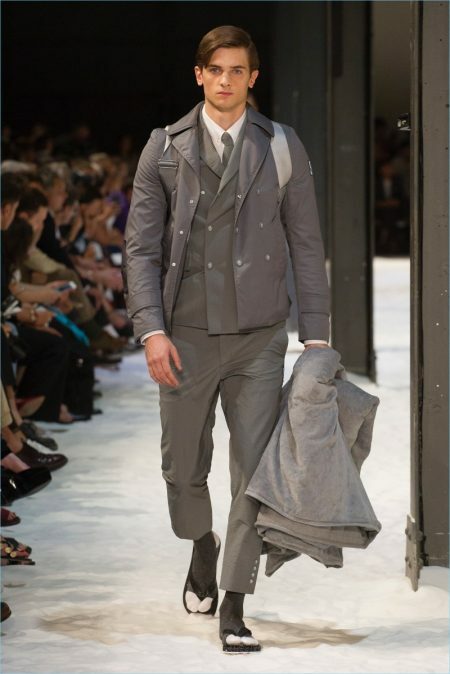 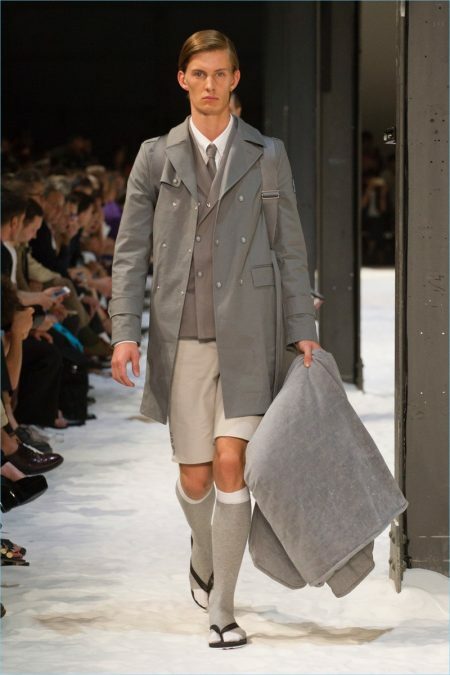 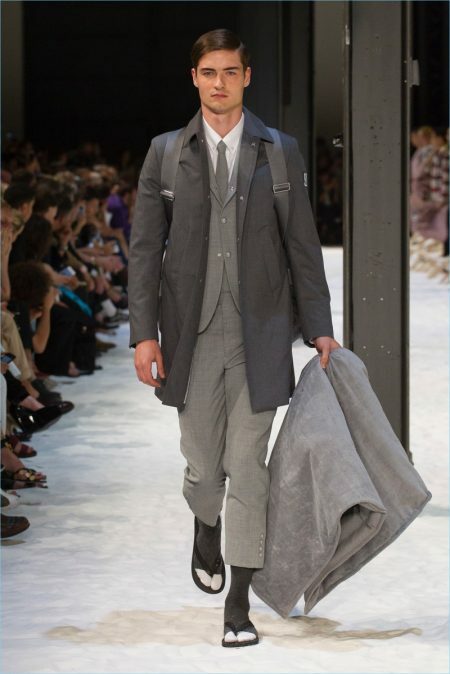 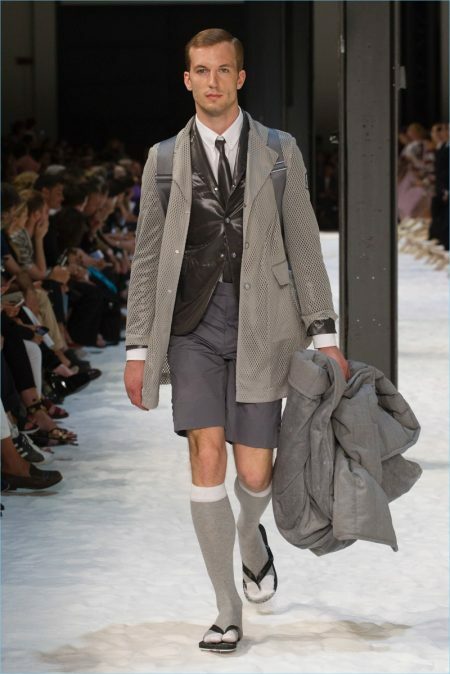 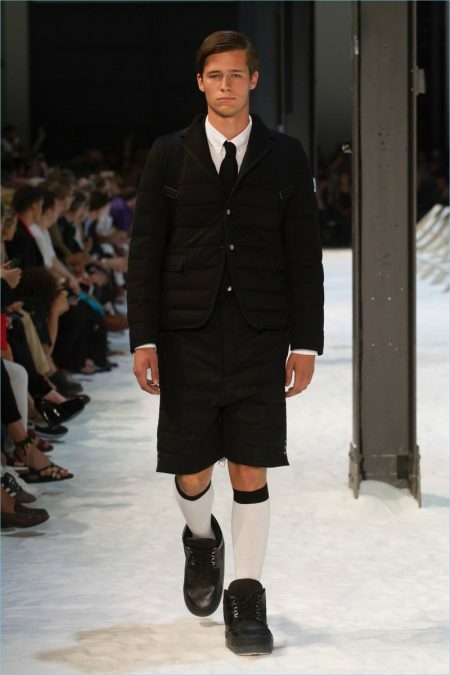 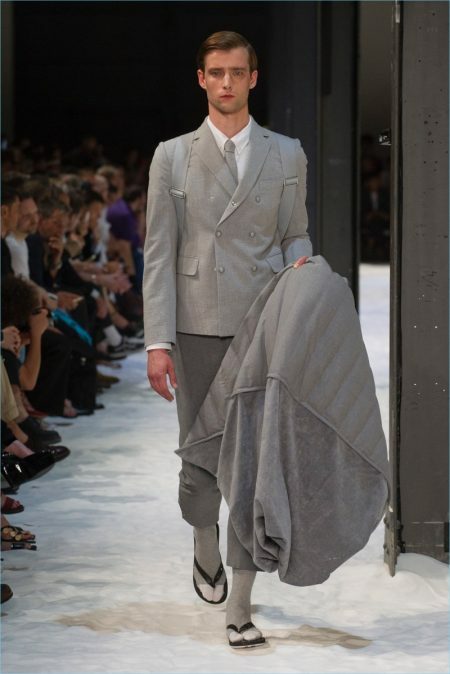 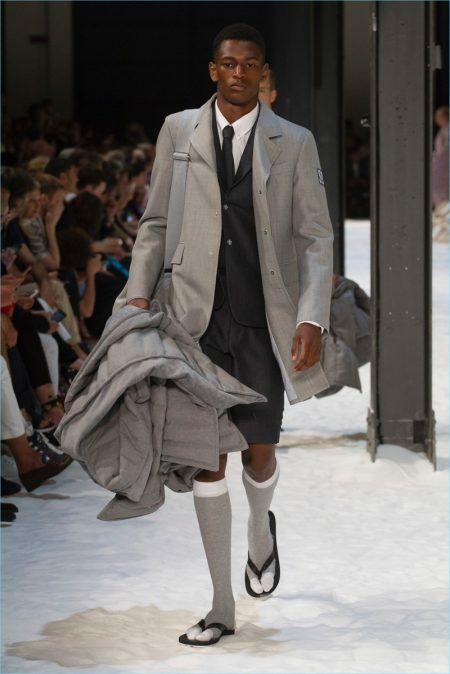 The quintessentially Thom Browne tailored pieces such as sport coats, Chesterfield coat, peacoat, trench, cardigan, polo shirts, trousers and shorts are made in both traditional wool suiting, cashmere, wool mohair, Calvary twill, cotton gabardine, cotton poplin, Mackintosh fabric, and seersucker as well as the same in the technical versions: technical wool, technical cashmere, nylon ripstop, mesh and rainproof slicker. 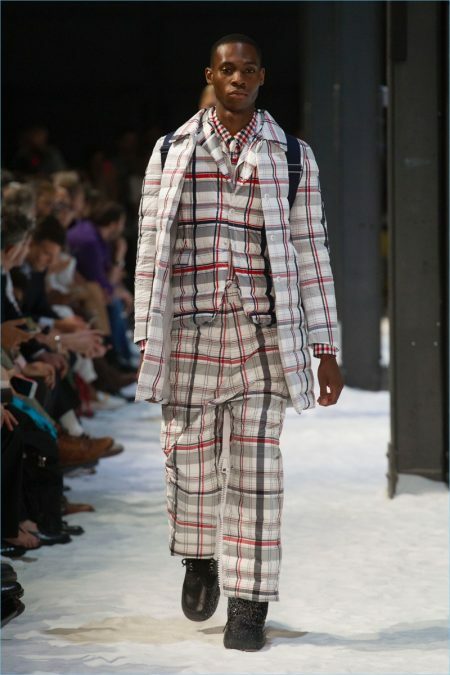 All fabrics have been developed for the collection with technical details such as embroidery, intarsia furs, water repellent finishes, checks created by embroidery or stitching. 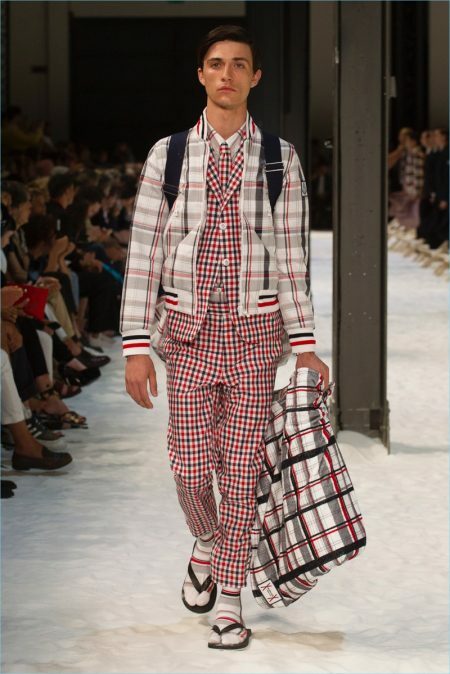 There will be madras plaids, gingham checks and seersucker stripes in the red, white and blue group, and the grey and black-tie groups in solid colors. 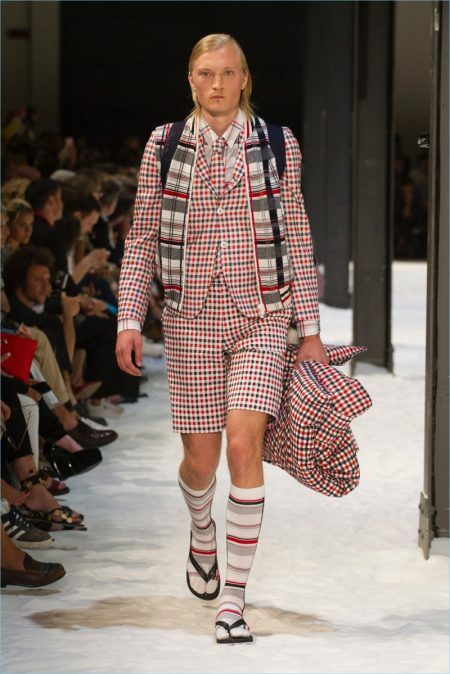 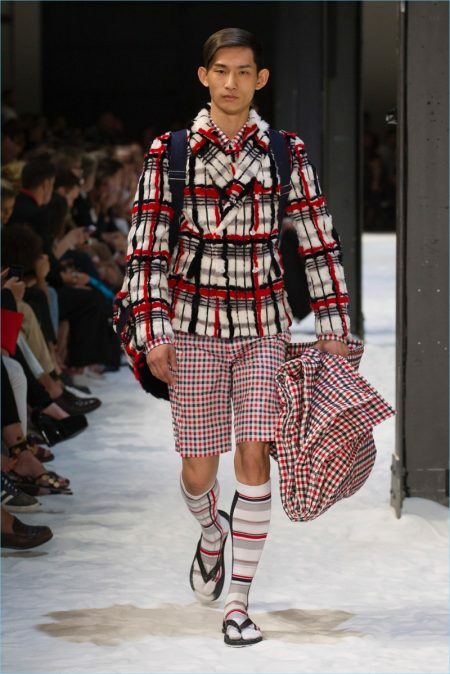 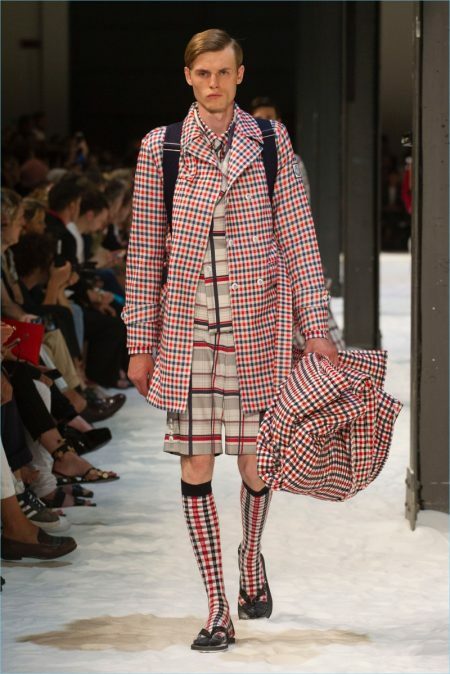 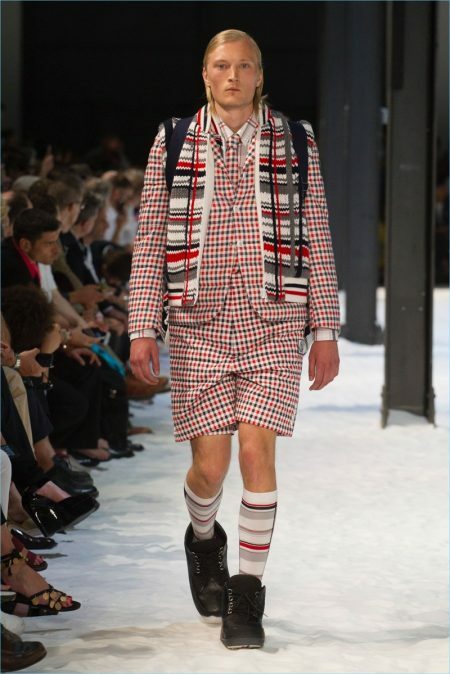 Accessories include, moonboots to represent the winter, and flip flops to represent the summer, as well as sailor bags in matching fabrics from the collection and quilted down filled beach towels in terrycloth to match the pattern in the collection.